Narsaiah, who is an Adivasi (Koya) man, commands tremendous respect in Yellandu. He's known as 'Prajala Manishi' (people's man), and people greet him warmly, when he appeals to them to vote for him. Every 200 metres on the narrow road leading to Khammam district, there's a stupa in memory of departed communists. The stupas, that reflect the politics of this region which still has a significant presence of the Left, have now been covered as part of the Model Code of Conduct in the poll bound state. But to remind the world that Khammam is still a citadel of the Left, the cadres have defaced the bus stand walls with their union names. After numerous calls, reluctantly, Gummadi Narsaiah, a five-time MLA belonging to the CPI (ML) New Democracy, agrees to meet me at Lingalla, a tiny village, while campaigning. Narsaiah is contesting from Yellandu, one of the ST reserved constituencies, which he has represented as MLA five times. Accompanied by a few students from Progressive and Democratic Students' Union and social activists who distribute pamphlets, he meets and greets everyone. Though he's a member of CPI (ML), since it is not a recognised party by the Election Commission of India, he contests as an "independent", and the symbol changes every election. However, his supporters claim that people not recognising a symbol was never a problem. "People know him and remember his symbol," shares Ashok, a PhD scholar from Kakatiya University, who is volunteering for Narsaiah's campaign. Narsaiah, who is an Adivasi (Koya) man, commands tremendous respect in Yellandu. He's known as 'Prajala Manishi' (people's man), and people greet him warmly, when he appeals to them to vote for him. Not just the voters, even his political opponents admire and respect him. Recently, when Narsaiah was admitted to a hospital for a heart condition, several leaders including Roads and Buildings minister Tummala Nageswara Rao, enquired about his health. "He eats and sleeps with us, when there's a need," says a tea shop owner. Even after he was voted out of power, Narsaiah regularly worked with the farmers. "My daily routine was to visit the party office everyday, meet the farmers and go along with them to Integrated Tribal Development Agency (ITDA), if they have some issue. Else, I go my field and do farming,” Narsaiah tells TNM. Narsaiah has won from Yellandu five times, with a hattrick in 1983, 1985, and 1989. But despite this, he identifies himself as a farmer, and believes deeply in the communist ideology. According to his supporters, Narsaiah’s political career began in 1978, after witnessing a “fake” encounter where an alleged Maoist, Ramachandraiah, was gunned down by the police in a forest, while he went to collect wood. "After the encounter, he worked extensively for farmers’ issues and then became the Sarpanch of Tekulapally. Seeing his organisation skills, the CPI (ML) elevated him to contest as an MLA," Ashok recalls. Narsaiah is a successor of Chapala Yerriah, who was forced to resign allegedly for supporting the Congress and distancing himself from the Left ideology. In his tenure as a legislator, he donated all the salary he received to the party, and also ensured that both his daughters and son studied in government schools and universities. Unlike communists, who use jargons to describe capitalism, oppression etc, Narsaiah speaks the language of a layman, which probably makes him dear to the masses. Despite enjoying the public goodwill of a leader with a "clean image" – who didn’t making any money for himself, akin to former Tripura Chief Minister Manik Sarkar – Narsaiah who is now 62 years old faced two setbacks in the last two elections. He attributes this to the constituency's division, that has weakened his position. "We don't have a strong organisation in these new wards," he admits. In the 2014 elections, he was not even in the fray, it was a contest between two mainstream parties – Congress and the Telugu Desam Party – where he secured a fourth position with 19,000 odd votes, which reveals the weakened position of the CPI (ML). 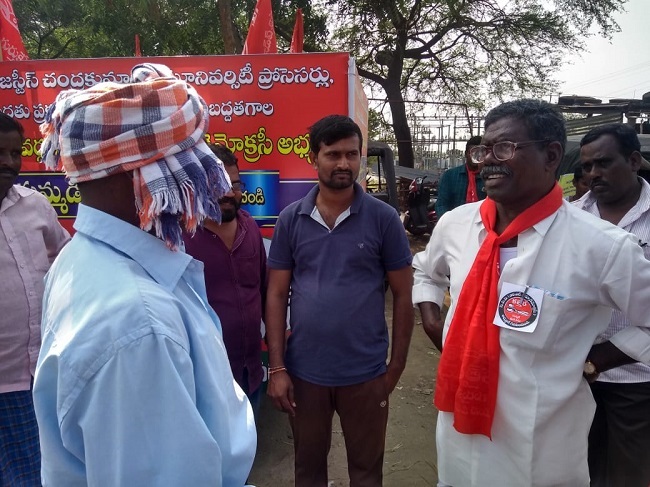 The CPI (ML) hopes to revive its fortunes and retain its past glory as a major force in the Khammam district through Narsaiah. 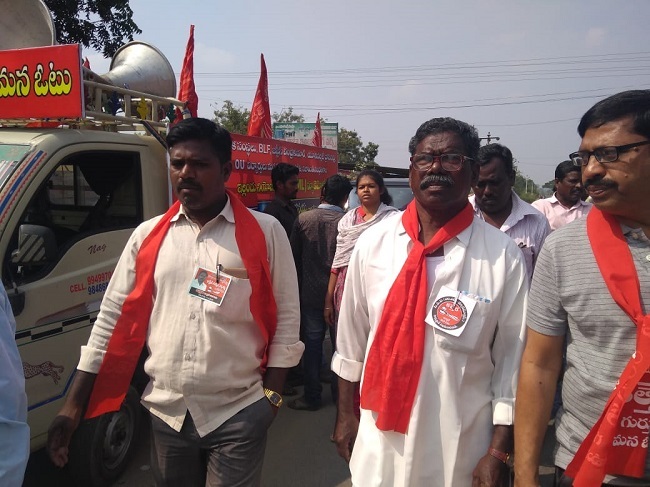 Several of its workers and key leaders were arrested by police on charges of either being Maoists or having links with Left extremists, which also has weakened the party's strength. The CPI (ML) also alleges that the Communist Party of India and Communist Party of India (Marxist) have been making attempts to weed out CPI (ML) from the region, since they are not able to gain a foothold. Though the party is fielding candidates from Pinapaka, Aswaraopeta, Sattupalli and Palair, the party is pinning hopes only on Narsaiah. However, the present political scenario in Yellandu which is divided on caste lines, makes it an uphill task for Narsaiah. The Lambadas who contribute to a large majority of nearly 40,000 voters, following SCs and BCs are mostly inclined towards the Congress candidate, Banothu Haripriya, a Lambada. It remains to be seen if Narsaiah can overcome this crisis and come to power.